Last time I talked about a new paper I wrote with Brendan Fong. It’s about electrical circuits made of ‘passive’ components, like resistors, inductors and capacitors. We showed these circuits are morphisms in a category. Moreover, there’s a functor sending each circuit to its ‘external behavior’: what it does, as seen by someone who can only measure voltages and currents at the terminals. • Brendan Fong, Decorated cospans. That’s how we compose these morphisms. We’re using maps from two sets and to the set of nodes of our graph. And a bit surprisingly, we’re not demanding that these maps be one-to-one. That turns out to be useful—and in general, when doing math, it’s dumb to make your definitions forbid certain possibilities unless you really need to. together some extra structure on the set . This extra structure is what Brendan calls a decoration, and it makes the cospan into a ‘decorated cospan’. 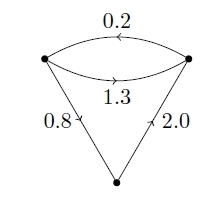 In this particular example, a decoration on is a way of making it into the nodes of a graph with edges labelled by positive numbers. But one could consider many other kinds of decorations: this idea is very general. • isomorphism classes of cospans between these as morphisms. So, Brendan defines decorated cospans at this high level of generality, and shows that under some mild conditions we can compose them, just as in the pictures we saw earlier. • isomorphism classes of -decorated cospans as its morphisms. 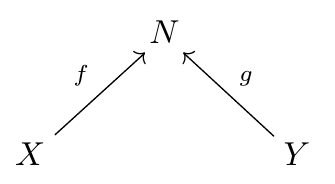 This is called the F-decorated cospan category, This category becomes symmetric monoidal in a natural way. It is then a dagger compact category. Brendan also explains how to get functors between decorated cospan categories. We need this in our paper on electrical circuits, because we consider several categories where morphisms is a circuit, or something that captures some aspect of a circuit. Most of these categories are decorated cospan categories. We want to get functors between them. And often we can just use Brendan’s general results to get the job done! No fuss, no muss: all the hard work has been done ahead of time. I expect to use this technology a lot in my work on network theory. This entry was posted on Friday, May 1st, 2015 at 9:16 pm and is filed under mathematics, networks. You can follow any responses to this entry through the RSS 2.0 feed. You can leave a response, or trackback from your own site. It is interesting the Decorated Cospan, it is similar to the field in physics: if there is a grid, in a N-dimensional space, and vectors along the field line, then Decorated Cospan seem that includes a physical field (within the limits of close points). Thanks for the comment domenico! Could you please elaborate a bit though? It sounds very interesting, but I’m afraid I don’t quite get it. What the cospans correspond to in your example? And what would the decorations be? I thought a normal vector field, where the points and the vectors are the decorated cospans (the arrows of the cospans like real vectors), so that graph and flow curves can coincides with a limit of close distance of the vector field representation. If it is so, then many theorems of the decorated cospans can be applied to the vector fields (with some limits), and vice versa. But I want to say here what we do in our paper, because it’s pretty cool and it took a few years. To get things to work, we needed my student Brendan Fong to invent the right category-theoretic formalism: ‘decorated cospans’. But we also had to figure out the right way to think about open dynamical systems!